Burial* 1863� Dollie "Doll" Melissa Graham was buried in 1863 at Hart Cemetery, Cochran, Bleckley County, GA.
[S380] Unknown subject MVW file. [S502] June Adams, Betsy Smith Robin Mullis, Bleckley County, Georgia Cemeteries. [S587] Unknown subject MVW file. Obituary 1938� Obnituary of Fannie C. Graham was Fannie Graham Jones,56, died at her home Friday after a long illness. Born in Pulaski County (now Bleckley). Survivors are her husband O. H. Jones. 3 sons: O .H. Jr., O. R., and H. W. Jones, a daughter: Mrs. J. D. Purser of Cochran, her mother: Mrs. L. C.Graham, 4 brothers W. D., J. E., and Herman Graham of Cochran and L. S. Graham of Eastman, 5 sisters: Mrs.J. W. Mullis, Mrs. J. E. Hinson, Mrs. J. D. NeSmith of Cochran and Mrs. R. F. Holland of Ocilla. Pallbearers were Calvin Hinson,J D. NeSmith, Isaac Dykes, Lewis Mullis, Tom Skipper, and Alvin Jones. Funeral services were held at Macedonia Baptist Church with Revs. J .F. .Dykes and S. L. Lamm officiating. Interment was in the church cemetery. T. W. Fisher and Son had charge of arrangements. 31st Regiment, Co. F, Georgia Volunteer Infantry, CSA Pulaski County, Georgia "Pulaski Blues"
There is a Green G. Graham born in 1785 who could be this person. Cochran, GA, January 2-- Mr. James Graham, a prosperous farmer, was found dead in front of his home on Christmas eve morning. He was shot Friday night about eight o'clock. The general supposition at first was that he committed suicide but after through investigation the conclusion reached was that he came to his death at the hands of unknown parties. His family was away from home and no one knew anything of his death at the time it occurred. He was shot with a shot gun and from the evidence he was shot at the space of several yards, as the shot scattered at least two feet over his body. Mr. Graham was evidently robbed as his pocket book and watch were missing and his papers scattered over the ground. Mr. Jim Graham, who resided near Younker, in Pulaski County was found dead in his yard on Friday night, December 23rd. , having been shot in the bowels with a shot gun. It is said that Mr. Graham had been drinking excessively and had run his family away from home, therefore no one knows the circumstances connected with the killing. Mr. Graham was about sixty years of age and leaves a wife and thirteen children. A PROCLAMATION. By J. M. Terrell, Govenor of Georgia. 1. JAMES1 GRAHAM was born May 25, 1855, and died December 23, 1904 in Dodge County, Georgia. He married LUCY CLEMENTINE HOBBS, daughter of J. HOBBS and UNITY SCARBOROUGH. She was born Abt. 1862. 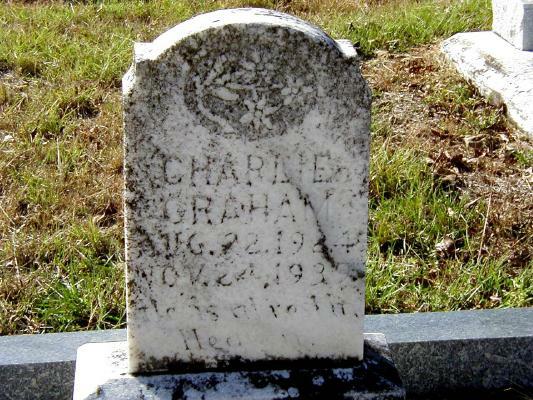 There is an unmarked grave beside the grave of James Graham and that is probably Lucy. i. MARY IDA2 GRAHAM, b. 1876; d. 1956; m. (1) WILLIAM DYKES, November 25, 1894, Pulaski County, Georgia; m. (2) JOHN HOLLAND, JR., November 06, 1906, Pulaski Co., GA; m. (3) JAMES WILLIAM MULLIS, December 22, 1915, Bleckley County, Georgia; b. June 16, 1872; d. January 04, 1930.
ii. CHARLOTTE GRAHAM, b. May 1878; m. ROBERT FRANK HOLLAND, December 22, 1895, Pulaski County, Georgia; b. August 1874.
iii. MARTHA A. E. GRAHAM, b. 1880; m. JAMES WILLIAM MULLIS, September 25, 1898, Pulaski County, Georgia; b. June 16, 1872; d. January 04, 1930.
iv. FANNIE C. GRAHAM, b. March 1882; d. April 15, 1938; m. OLIVER JONES, August 26, 1900, Pulaski County, Georgia. Fannie Graham Jones,56, died at her home Friday after a long illness. Born in Pulaski County (now Bleckley). Survivors are her husband O. H. Jones. 3 sons: O .H. Jr., O. R., and H. W. Jones, a daughter: Mrs. J. D. Purser of Cochran, her mother: Mrs. L. C.Graham, 4 brothers W. D., J. E., and Herman Graham of Cochran and L. S. Graham of Eastman, 5 sisters: Mrs.J. W. Mullis, Mrs. J. E. Hinson, Mrs. J. D. NeSmith of Cochran and Mrs. R. F. Holland of Ocilla. Pallbearers were Calvin Hinson,J D. NeSmith, Isaac Dykes, Lewis Mullis, Tom Skipper, and Alvin Jones. Funeral services were held at Macedonia Baptist Church with Revs. J .F. .Dykes and S. L. Lamm officiating. Interment was in the church cemetery. T. W. Fisher and Son had charge of arrangements. There are no dates on the tombstone. v. LEILA M. GRAHAM, b. December 09, 1884; d. November 03, 1957; m. JOSEPH EDWARD HINSON, December 15, 1901, Pulaski County, Georgia; b. August 27, 1882; d. January 22, 1954.
vi. 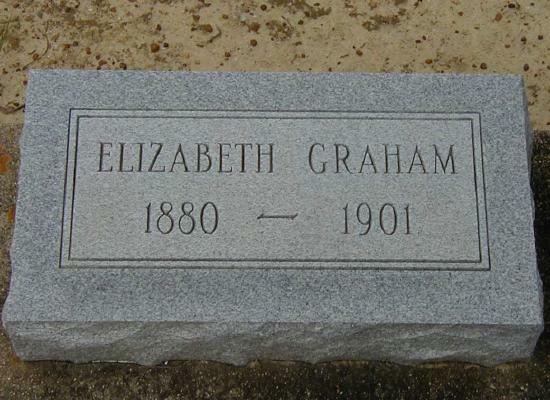 WILLIAM D. GRAHAM, b. December 1886; m. JULIA CARR, August 29, 1915, Bleckley County, Georgia. vii. LOLA J. GRAHAM, b. December 1889; d. 1970; m. JESSE C. NESMITH, March 20, 1904, Pulaski County, Georgia; b. 1885; d. 1966.
viii. LARRY SAMUEL GRAHAM, b. 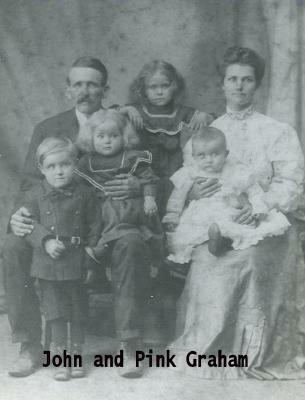 March 19, 1891; d. May 31, 1950; m. NORA PUSSER, July 14, 1907, Pulaski County, Georgia; b. March 27, 1891; d. May 20, 1977. Larry Samuel Graham, well known livestock dealer of Eastman, died Wednesday morning a few moments after he suffered a heart attack at 6 o'clock while driving home in his car. He had been to town early and was returning home. When seized, Mr. Graham lost control of his car and the vehicle traveled approximately 100 yards before it struck a telephone pole in front of the Lewis Mullis home on Oak Street. Mr. Graham was not injured in the accident. He was dead upon arrival at a local hospital. He was a native of Bleckley County, the son of the late Jim and Clementine Hobbs Graham. He was 58 years old. Funeral services were conducted at the residence this afternoon at four o'clock by Rev. 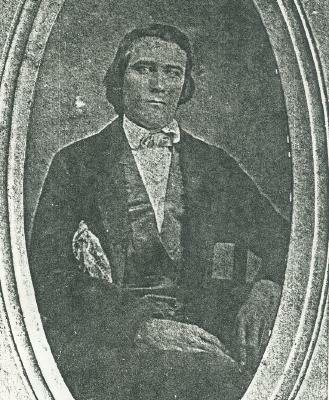 Max O'Neal, pastor of the First Baptist Church. Sacred selections were sung by Mrs. Billie Pinnell and Mrs. Gertrude Harrell, accompanied by Miss Carolyn Bowen. Pallbearers were Otis Whigham, Eugene Yawn, William Sanders, W. B. Joiner, Lewis Mullis and Johnnie Parson. Interment was in Woodlawn Cemetery, Horne Funeral Home in Charge. ix. BIRTHA L. GRAHAM, b. January 15, 1893; d. October 04, 1908.
x. JOSIE ALICE GRAHAM, b. April 15, 1895; d. January 06, 1975; m. HEZIAKAH MEADOWS, January 07, 1912, Pulaski County, Georgia; b. March 17, 1891; d. February 24, 1965.
xi. JAMES EARL GRAHAM, b. April 1898.
xii. JOHNNIE GRAHAM, b. February 1900; m. EVA HINSON, August 08, 1920, Bleckley County, Georgia. xiii. ERNEST GRAHAM, b. Abt. 1902.
xiv. 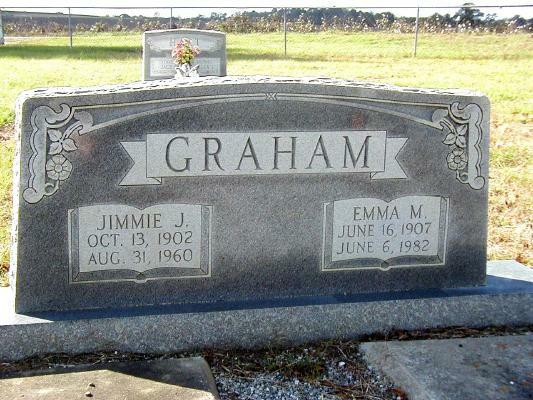 HERMAN GRAHAM, b. February 16, 1904; d. October 08, 1969; m. TYNIE PHILLIPS, July 08, 1923, Bleckley County, Georgia; b. October 28, 1906; d. April 15, 1988. 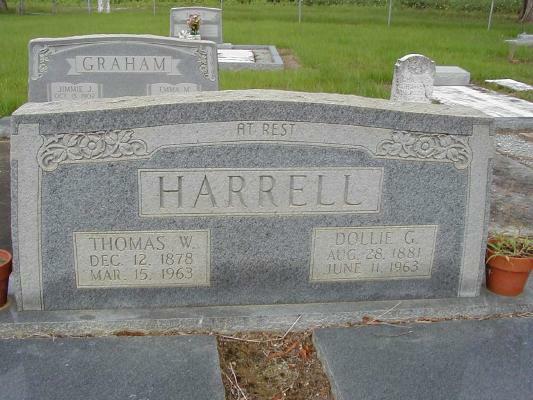 Burial* 1960� He was buried in 1960 at Hart Cemetery, Cochran, Bleckley County, GA. 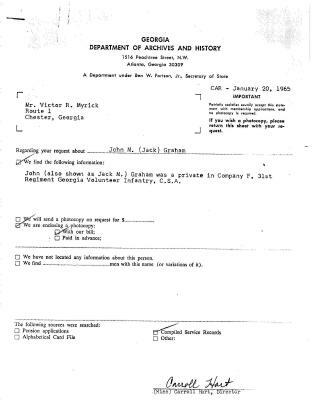 Note* � Ed Harmon wrote: I have also found a note from Victor (Myrick)telling my mother that John Allen "Jack" Graham was "as mean as a snake" and was himself tried for murder in Georgia, but was acquitted. However, according to Victor, the family all said he was guilty. Oh, it is also said that John Allen Graham sold the property of his wife, Mazura Hart Graham, by forging her signature on the sale papers. Graham, John (Jack) M. - Private May 5, 1862. Roll dated Nov. 6, 1864, last on file, shows him Present. No later record. See attached document. John (Jack) was a private in Company F 31st Regiment of Georgia Volunteer Infantry CSA. According to his wife's application for a widow's pension he surrendered at Appomattax Virginia. Death* 1982� In 1982 In a note Ed Harmon writes: This weekend I came across a note on a paper in my mother's files. The note was apparently made in the 80s and said "John Graham having breakfast before going to field to work, fell over dead. Cerebral hemorrhage." Note from Margot. I think this is the John she was referring to. He is the son of Pink and John. 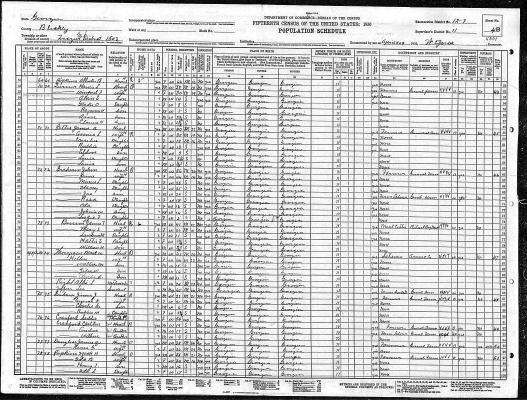 MARRIAGE* 29 April 1900� He married Pinkney Davis, daughter of William (Bill) Davis and Lulla (Lou) Sparrow, on 29 April 1900 at Pulaski County, GA, From this record it appears that Pink married John Graham eight years before he murdered her step parents. This is contrary to Viola Floyd Berryhill's account. The date of the murder is supported by Viola and an account in a local history book. In 1880 the Graham family lived next door to the Harts when John was five and Pink was probably about the same age. MVW 09-01 The saddest part of this story is the example of two innocent Negroes being killed. This was not an isolated occurrance.The 1910 census says they were married eight years putting the date as 1902. A note from Ed Harmon sheds some more thought on this. Death* after 1956� He died after 1956 He is said to have died after his wife. Here is a note relative to it from Jimmie Lee Davis: Yes, that's the story we have always been told about the murders. Uncle Jesse (Pete's oldest son by Maggie) was probably about the same age or maybe 10 years old. 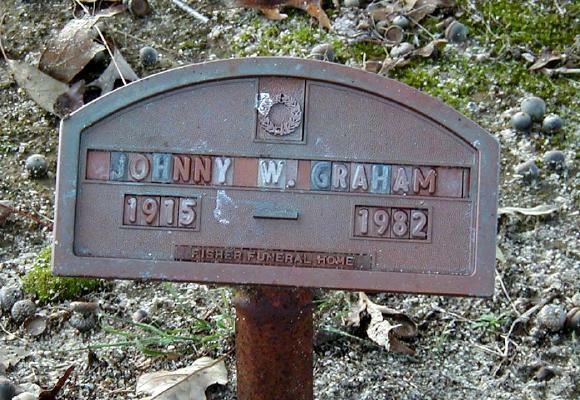 He and Jerry's dad told us that the Graham man was in Jacksonville, FL at the time of his death and did confess on his death bed. I'm not positive about that. Note � Thanks Bob, I plotted the Graham deed out myself and came to the same conclusion. I've been thinking a lot about the murder and find the motive of robbery hard to accept. Why? Because John Graham would know when the Harts were out going to church. That would be a perfect time to commit a robbery. Murder takes a lot of passion - one has to get really worked up emotionally to do such a thing. Just put yourself in his shoes. Wouldn't you have to be in a real frenzy to knock two people over the head? I keep thinking that there must have been some really emotional trouble here and the place was staged to appear the motive was robbery. Not only that - how could he be sure no one would show up and find him in the middle of the crime. Why didn't he shoot them? Anyhow, I keep turning this over in my mind and probably never will know the answer. Have just returned from Hawkinsville and Macon. Did not find anything earth shattering, but did pick up a few tid bits. They are in no special order, only the order they come off of the stack. The map that Victor (?) had marked up ( Road map w/ land lots by county) is available, w/o marks, from the tax appraisers office in each county for $3 to $4. I have been looking for them for some time. In our case, you need one from Pulaski, Beckley and Dodge Counties to cover all the bases. If you look at the deed Jimmie Lee sent where John Graham purchases 50 acres of land, the farm on the deed was"known as the Geo K. Hart place", not the Warren Hart farm. If Ed's map is correct , Warren's farm was in Land Lot # 179 and the Geo. K Hart place was in LL 182. So it looks as if he did not end up with Warren & Sallies farm after all. The question is,, where did a laborer get $700 to purchase the farm? From Tad Evans "Pulaski County, Georgia, Newspaper Clippings, Volume IV, 1888-1897", in the newspaper printed "Thursday, July 17, 1890" the following; "Mr. William Davis, a good citizen of this county, died on Tuesday night of last week of typhoid fever. He was about 38 years old, and leaves a family and large circle of relatives and friends to mourn his loss". Look as if he died 8 Jul 1890. In similar articles, they would say "leaves a husband / wife and children". Since they didn't, I assume Lulu Davis died before him but I was not able to find anything to substantiate this. 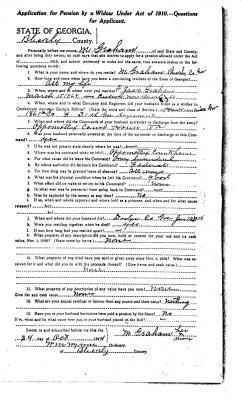 Jimmie Lee did you have the article where Ben F. Dave requested guardianship of the Davis kids? If so would you send me the details again. In Volume V, 1898 - 1907, by Tad Evans, in the Thursday, August 16 1900 paper, the following; "Mr. Ben F. Davis, aged fifty-two years, died at his home about seven miles east of town this (Wednesday) morning at half past eight o'clock. Mr. Davis had been sick only about a week, his death being due to congestion of the bowels. He leaves a wife and three children. His remains will be interred in the family burying grounds Thursday afternoon." I assume he died 15 Aug 1900 and was buried 16 Aug 1900. Wonder where the family burying ground is located. I did a title search for the land owned by Warren Hart but it and the disposal thereof was not there. It appears the land records were reconstructed after perhaps after a fire and are missing some early deeds. It was a common practice when a courthouse burned, to have the people bring in there recorded deeds and rewrite the books. I was also not able to find any new deeds on Land Lot 211, Division 21, the land of James Everette Floyd. Anecdote* � Ed Harmon was asked if he knew about the Hart murders. Here is his reply: Margot, The story you related, is the Gospel. It is the same story told by my grandmother, Mamie Davis Jones to me. I heard the story as a child growing up, in the early 1950s. It was later changed to include the confession. Apparently after John died. I can add some details for you. Warren was killed while feeding the mules and Sally while frying bacon. Actually the story is much worse from the stand point of John Graham; According to my grandmother the bloody axe was hidden in the wood pile, where the farm hand had been chopping wood the day before, outside the back door. Then apparently the scene was set up so to make to look like it was a robbery by turning the kitchen upside down, going through the flower, etc. John left and the black farm hands then discovered the murders and ran off, knowing that with two murdered white people they would be in trouble. A mob consisting of the neighbors was formed and they went after the two. My grandmother said that every time a black would run, the black was shot dead on the spot. When the mob finally caught up with the blacks that were "guilty of the murders," they were captured, returned to the house, hung, then shot and their bodies were covered in pine pitch, set afire and burned, while hanging. The tree was in the yard or very near the home place. My grandmother said that grass would never grow under the tree where the hanging took place. The ropes were left in the tree for a long time. One can only surmise that John Graham was a participant or leader of the mob. I understood that he killed his uncle and aunt for money that people said they had hidden in the house. But that may be just part of the original story. In any case, either story about the motive seems logical. Your time line is right, I was told about the confession sometime in the late 1970s or the 1980s as I recall. As a young man hearing the story, it would be easier for my grandmother to say that the murder was over money rather than relations with a first cousin. But, at first telling, it was without the confession, so the story would not include the confession details. I do not think the motive was that important to her, but of course it does play an important part in the family history. Once it became known that John did the murders, it became a family "secret" that wasn't much of a secret, due to the prior telling. But, I did hear a family member tell the story one time, after I knew about the confession, and I knew that they knew about the confession, and they left out the end. So there are some in the family that consider the confession something to be at least, "left out", of the tale. Besides, for true, if so many folks ended up dead for something they had no part in, it is not something of which one should be proud. 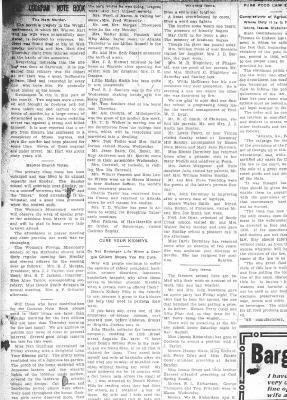 "It is not improbable that Governor Smith will take some steps towards investigating the recent lynching of several negroes near Hawkinsville, Georgia and he may offer large rewards for the apprehension and conviction of the guilty parties. He has declined to discuss the matter, but it is known that he views the occurrence as an unfortunate one, and it is said he is inclined to think that it should not be allowed to pass unnoticed. The negroes - some reports say two and others increase the number to four or five - were lynched for the murder of an aged white couple, the purpose being robbery. Their guilt was established on the confession of one of their number. After being hanged the bodies were burned. It is the second occurrence of this kind to take place in Georgia since Governor Smith entered office. The first happened a few days after his inauguration, when a white man was summarily put to death near Dalton. Beyond ordering a full investigation on the part of the county officials, the Governor's authority does not extend far - possibly no further than the ability to offer substantial rewards." Exaggerated reports of the affair made it appear worse than it really was, though it was bad enough. There were only three in all killed, but according to the reports the number varied all the way from three to seven, including one woman. Reports sent to the daily papers were magnified in such a manner as to make it appear ridiculous to those familiar with the situation. It was stated in one of these reports that the negroes were taken from the jail at Hawkinsville, but as a matter of fact they were not brought here at all. 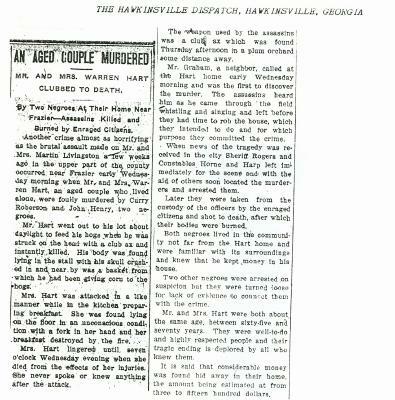 Another report stated that the Negroes were fleeing from Hawkinsville for safety, although the city was as quiet as a lamb and there was no indication whatever of a disturbance here. The horrible tragedy in the Wright settlement in which Mr. Warren Hart and his wife were unmercifully murdered is deplored by everyone. Mr. Hart was found dead at his lot Wednesday morning and Mrs. Hart died Thursday night from injuries received at the hand of the assassins. Everything indicates that the killing was done at daybreak. It is presumed that robbery was the object as Mr. Hart was a quiet inoffensive citizen liked and respected by everyone who knew him. He generally kept money at his house. Note 2001� Not only did John Graham murder his wife's adoptive parents, but they were also his Aunt and Uncle as well. He had grown up living next door to the couple he eventually killed. He committed family murder then let two Negros take the wrap! As can be seen from the attached article, not only did John Graham discover the bodies, but also provided himself with an alibi. 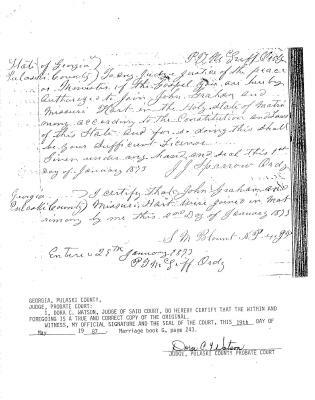 MARRIAGE* 29 April 1900� He married Pinkney Davis, daughter of William (Bill) Davis and Lulla (Lou) Sparrow, on 29 April 1900 at GA From this record it appears that Pink married John Graham eight years before he murdered her step parents. This is contrary to Viola Floyd Berryhill's account. The date of the murder is supported by Viola and an account in a local history book. In 1880 the Graham family lived next door to the Harts when John was five and Pink was probably about the same age. MVW 09-01 The saddest part of this story is the example of two innocent Negroes being killed. This was not an isolated occurrance.The 1910 census says they were married eight years putting the date as 1902. Graham, Joseph M. - Private May 5, 1862. Captured at Spotsylvania, Va. May 12, 1864. Paroled at Fort Deleware, Del. Feb 1865. Recieved at Boulware & Coxe's Wharves, James River, Va. Mar 10-12, 1865. Admitted to Receiving & Wayside Hospital no.9, at Richmond, Va. Mar. 13, 1865. "Disposition 30 days March 14,1865".